Unfortunately, your garage door won't last forever, and at some point in time it will probably breakdown due to some type of malfunction. Our experts at Garage Door Repair Oceanside, NY wrote a blog post that details what you can expect. Read it here.As the largest moving part of your house, not to mention the one that's most frequently used, your garage door is bound to experience some issues over time. Wear and tear affect every large mechanical system, and although the eventual breakdown can be delayed, without proper maintenance and care, your door will undoubtedly experience one of the following problems. 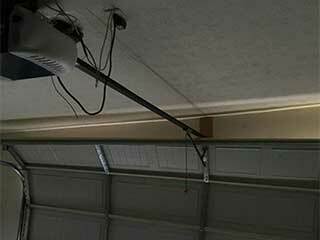 If you haven't replaced your old chain-drive garage door opener with a new and silent belt drive model, noise is probably an inseparable part of using your door. Chain-drive openers are known for being strong and cheap, but also very loud. However, if the noise levels start to rise more than they used to, or if new sounds are mixing into what you've become used to, you may need to check on the system's moving parts. The springs, tracks, rollers, and hinges should all be inspected to make sure they haven't become damaged or rusty. You can try lubricating the appropriate parts and see if the squeaking stops after that. If it doesn't, the problem could be more severe than you think, and you should give our experts a call right away. Every garage door opener manufactured after 1993 comes with an automatic safety reverse feature, which helps reduce the risks of garage-door related injuries. This feature is often aided by a pair of photoelectric sensors that are placed at about six inches above the floor on both sides of the garage's opening, usually attached to the vertical each of the tracks. If anything or anyone passes through the opening, while the door is trying to close, these components will alert the opener and the door will reverse. If the sensors become misaligned, they will not work properly, and the safety of you and your family members will be compromised. You should test these components once or twice a month to make sure that your door stays safe to use. If your opener is not reacting when you use your remote control, there could be something wrong with either unit. If you are able to open your door using your wall mounted switch, then the issue is probably with the remote. Before doing anything else, you should check the batteries. Too often do people neglect to replace them when they're supposed to. You can also try reprograming your remote (your opener's manual will explain how to do that). Of course, if all else fails, you'll probably need to get the remote replaced. Our team can help you find the perfect replacement. If your door is acting up and you've inspected all the possible culprits and found none of them is at fault, the problem could lie with some interior part of the opener. If it's making a whirring sound but the door won't move, the problem could be with the motor gear. Strange electricity issues and a door that keeps acting erratically could be a sign that a part of the circuit board got fried or sustained some damage. These issues require an experts' assistance, so don't hesitate to reach out to us if this is the case. These are unfortunately the most common and perhaps the most dangerous issues. Garage door springs are built to last for approximately 5000 to 10,000 cycles, depending on their type, manufacturer, and how much maintenance they receive. The more often you use your door, the more strain, and wear and tear these components go through, and the higher the chance that eventually you'll have a broken spring on your hands. The high amount of tension these components are under on a daily basis makes any necessary spring replacement or adjustment very dangerous, and you should leave it to our experts. No matter what type of issue is causing your system to malfunction, you can count on our team at Garage Door Repair Oceanside for assistance.